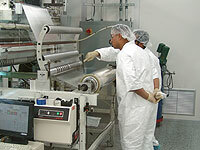 WFT's production department offers high quality Roll to Roll embossing service. This service lends itself best for micro-structures that demand very high quality due to our proprietary UV Cast Cure technology. Unlike thermal embossing our technique allows the finest details of a microstructure to be reproduced down to nanometer size. These micro-structures include specialty/packaging films, lens films, security images, holographic optical elements (HOE), diffraction gratings such as Rainbow, or prismatic/lenticular structures up to 150 microns deep. Click here to watch the Production Video. 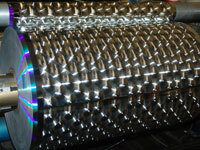 WFT currently mass produces in a roll-to roll process, products such as tailored microstructure diffusers (TMD), specialty films, diffraction gratings, security holograms, moth-eye antireflection film, and various microstructure film for applications such as packaging, backlights, micro-fluidics, drag reduction, fluidic self-assembly, and prismatic films. WFT works with the customer to provide the best product at the most effective price. Toll embossing is one method used to achieve this. In the past, customers have provided the master surface relief tool used to make product, the substrate material, and even the polymer used to cast the product.